Retractableawnings.com® 6 different valance styles for our retractable folding lateral arm awnings. 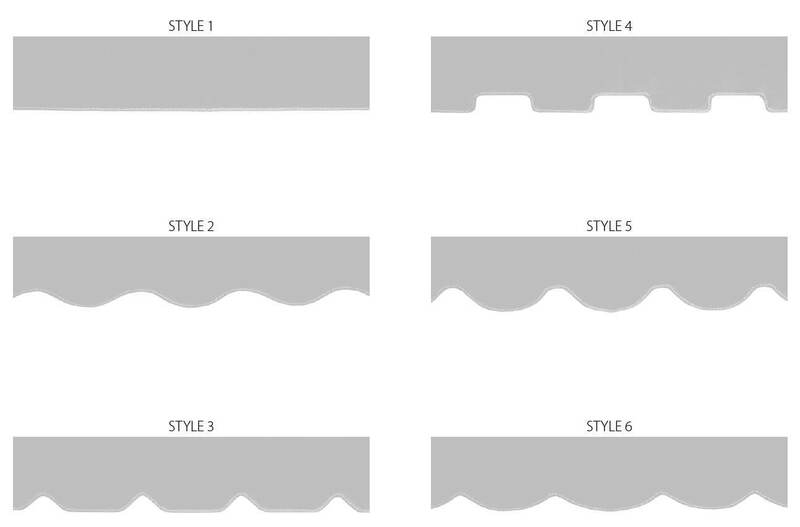 Style 2 and Style 6 are the most popular, but feel free to choose any style you like. The Venezia model does not have a valance as it is a FULL cassette awning. Click here to see a larger version all 6 styles. The valance on all models is normally 8 inches in height and can be made up to 12 inches in height (for additional early morning or late afternoon sun protection) if requested at no additional charge. The valance is the same color as the main fabric chosen. The awning valance has solution dyed acrylic binding / trim / piping attached to the bottom of the valance that will accent the valance style chosen. The binding / trim / piping is only about 1/4" wide on the front and back of the bottom of the awning valance. To see all the binding / trim / piping colors, click here. If you choose a striped fabric or a fabric with designs on it, please note that the stripes or designs are not designed to align with the shape of the particular valance style chosen. In addition, when we pneumatically computer sew our fabric valances and awning covers, we use a full piece of fabric in the middle and then sew from the middle to the outer edges. Why, you ask? We want our covers to look great, so we do this because that way on striped or patterned fabrics the stripe or pattern is the same on BOTH edges of the retractable awning. It costs us more but you're worth it! Also note, that the awning valance is easily removable from the front bar on all retractable folding lateral arm awnings by simply removing the end cap and loosening a couple of screws on both ends. It is recommended to remove the retractable awning valance prior to high winds - those greater than approximately 20-25 mph and during the winter months. There is no additional cost for the awning valance.